You want to easily open XML or PCD files? Use ProCAM Lite! 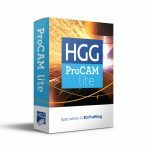 If you want to open and view XML or PCD files without CAD software, you now can easily use HGG ProCAM Lite. HGG’s software developers developed HGG ProCAM Lite for manufacturers, fabricators, designers, detailers and any other who needs to view and check cutting data. HGG ProCAM Lite is the first software that enables users to view as well as check 3D cutting details on pipes, beams, bulbs and other profiles prior to cutting. Neither a cutting machine nor viewing software is required for users to benefit from this software and improve cutting productivity. HGG ProCAM Lite software currently consists of two program parts: a DSTV viewer and a pipe viewer. Using HGG ProCAM Lite you can not only view your cutting files, it’s also possible to perform a final production check, using the interactive measurement tool. You can now review any DSTV, NC, XML or PCD file, viewing all parameters and weld details, including root openings and markings prior to cutting and production.